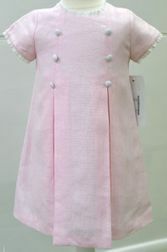 A beautiful and sophisticated dress for toddler girls by Claire & Charlie. 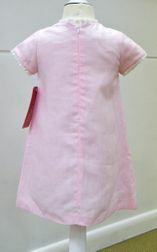 It is made in a pink linen embellished with 6 white covered buttons on the bodice and inverted pleats extending down from the button rows to the hem. The neck and sleeves are trimmed with white ruffles. Perfect dress for Easter, parties and Easter Sunday church!